It’s a longstanding Christmas Eve tradition to leave out cookies and milk for Santa. But what happens if kids pour a big glass of milk for Santa before they go to bed around 9 p.m. – but then he doesn’t arrive until well after midnight? It’s not going to taste fresh, and might even be not safe to drink. A better idea is to leave out a shelf safe milk box with those cookies. It’s Grade A, real milk that doesn't require refrigeration until it’s opened (no preservatives added). Single-serving milk boxes – similar to juice boxes – can be stored in the pantry for up to six months without refrigeration. 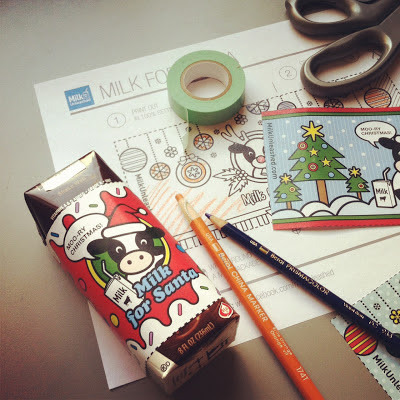 For a fun kids craft idea, create a custom cover for the milk carton. Click here for a template to print out and color, paint or bedazzle! Upload a photo of your kids’ creations to the Milk Unleashed Facebook page or Twitter to get free samples of shelf safe milk.